UNFORTUNATELY, THIS ITEM IS NO LONGER AVAILABLE. It's one of the traditional pictures of the holiday season in 20th Century America -- the whole family gathered around the bright lights of the Christmas tree as the radio plays softly in the background. 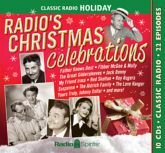 From the very beginning of the medium, there's been a strong connection between the holiday and broadcast radio. Whether it's Jack Benny going shopping, Johnny Dollar stopping suspicious Santas, or a drama desperate for a miracle - no matter the performer, no matter the style, Christmas always brought the most merry and moving of messages to the air.